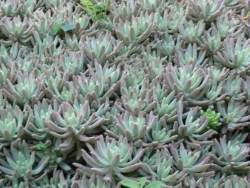 What is so interesting about Xeriscaping and growing succulents? 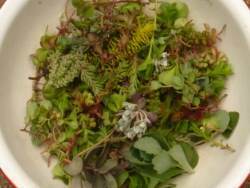 Here are ten reasons why I'll always grow these fascinating plants in my garden. The main reason is that they are fascinating. I'm always interested in the face they'll show next - they're always changing, sometimes from the weather, or the amount of sun they get, or the number of times they are watered, or not. You might have different reasons to grow them. Maybe you only have a small area to garden, and want to grow plants in pots - succulents excel at staying healthy, even without a lot of soil. 1) Succulents are beautiful, varied and reliable, and can be planted in rock gardens, rustic salvaged containers, topiary crafts and so much more; the textures are endlessly fascinating and intriguing. I make unique and unusual planters to display them in as they have such shallow root systems they don’t require deep containers. 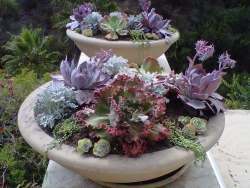 This makes them ideal, and fun, to plant in hypertufa pots, thrift store finds and other rustic containers. 2) The flowers attract many butterflies for the nectar and pollen, so your garden can not only be beautiful for you too look at, but provide a sanctuary for wildlife and beneficial insects. 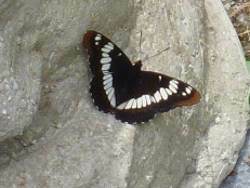 Last summer, I was spellbound by the many butterflies and solitary bees visiting the stock plants in my driveway rock garden. Seeing the excitement was contagious and made me want to give them even more reasons to stick around. I made sure that I left some weeds and native plants for them to forage on, and lay eggs for the next generation. 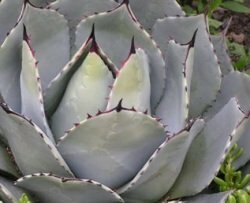 3) The water you use while your succulents are getting established will be paid back in the years to come when they blithely flourish even during extreme drought. With just natural rainfall, my gardens thrive. Once the roots get down to lower layers, they can withstand really dry conditions. If a drought is prolonged, they have strategies that enable them to shrivel to a shadow of their former selves, and then magically plump up again when it rains, giving me even more reasons to admire them. 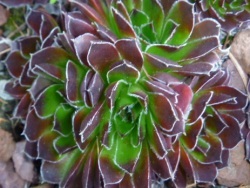 4) It’s easy to have more plants by propagating them; the Sedum from cuttings, and the Sempervivum from their chicks. I love the Sempervivum, and their related Jovibarba with their little propagules called rollers. They can create a colony in a few seasons; most of these rosette forming succulents make many babies, the gift that keeps on giving. 5) As an added bonus, they’re really easy to share; they ship dry, without the need for careful packaging and water. Once the recipient gets their package in the mail, the fun begins; plant, and water and stand back while they recover and grow. I love to share my plants with similarly addicted gardeners. 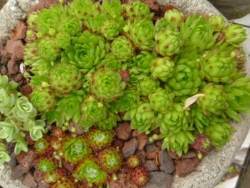 A new inductee to the succulent obsession is fun to see; they want all the different types they can get their hands on; I have over 200 different named varieties of Sempervivum, sixty or so Sedum and many other different and unusual alpine succulent plants like Rosularia and Orostachys. 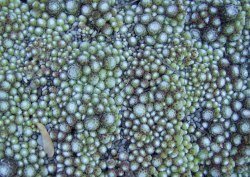 6) They cover the ground quickly, with deep (but non invasive) root systems. This holds the soil in your garden, instead of washing away with rain storms. The two kinds of roots that Sempervivum and other succulents have make it easy to conserve the soil; the fine feeder roots can get surface moisture from a sprinkling shower, and the thick taproot finds moisture deep in the soil. Both of these make a soil holding network. Since I’ve started seeing my plants completely covering the soil to protect it, I seldom have any run off. 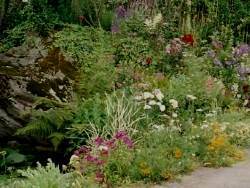 7) The textures and different species and varieties of many genera can be an enthralling hobby for collectors, and joyous to closely inspect for everyone else, experienced gardener and novice alike. The sheer diversity is astonishing. I’ll spend hours inspecting my plants, marveling at their colors, which can change rapidly over the growing season. 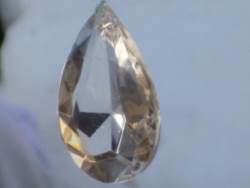 Seeing how lush and jewel like, each type with its own texture is so interesting. Not only are these great plants for gardeners, but artistic types love them too. 8) In an established bed of hardy succulents, very few weeds can get through the thick lush growth. 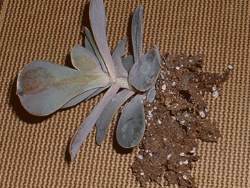 Most weeds require moisture and a fertile soil to grow well; hardy succulents not so much. I use the matt forming Sedum and cobweb hens and chicks as a groundcover in many areas of my garden, for this purpose (as well as their beauty). 9) As a Certified Horticulturist, I’ve grown lots of different plants, but these are hands down the easiest and most accommodating plants to grow in challenging conditions. Anyone can have great success, even in drought conditions. Sharing my knowledge about which plants to grow for a great looking healthy garden is one of my greatest pleasures. Seeing a novice gardeners glowing face when they realize how successful they can be, or the covetous look of a fellow collector when they see a new and different Sedum, and the pleasure they feel when I offer a cutting (or more likely, a clump) is so satisfying. 10) Xeriscaping is a type of gardening using very little water – but the astonishing thing is, you can still have color, texture and lively activity from insects that visit these plants, and the little creatures like lizards that love the rock walls and raised beds that Sedum and Sempervivum thrive in. My gardens give me so much satisfaction; not only have I built most of the raised beds single handedly, but I’ve chosen the plants that fill that perfect niche. Taking what would normally be a drawback – shallow well, sandy acid soil, rocks galore – and forging them into a gorgeous, brilliant, low maintenance display has become my biggest pleasure. 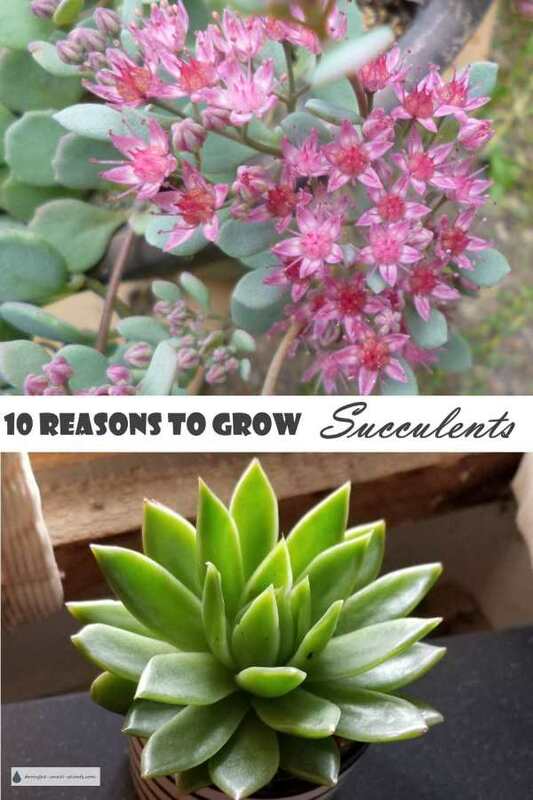 Interested in growing your own gorgeous Succulents ? Start here at my affiliate.